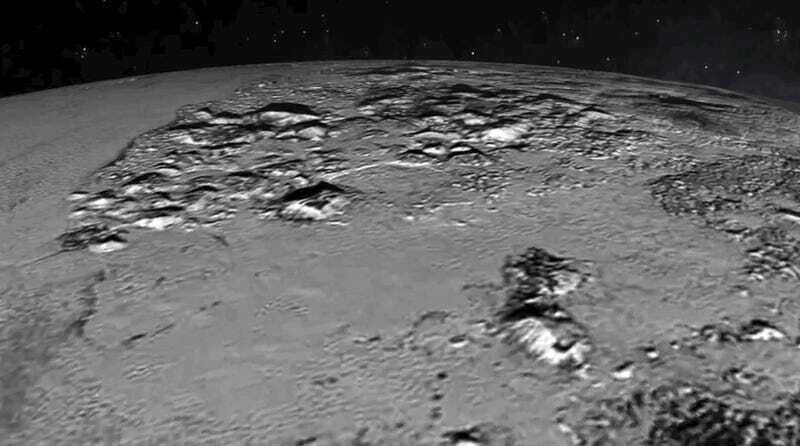 This animated flyover of the Norgay mountains and Sputnik plains on Pluto are based on the freshly-delivered close-approach images from the New Horizons flyby. See features just a single kilometre big as you experience what it would be like to hitch a ride on the spacecraft as it skimmed past the dwarf planet. This flyby is over part of Tombaugh Regio, the massive heart of Pluto. The mountains, Norgay Montes, are named for Tenzing Norgay. Norgay was the Nepalese sherpa who accompanied Edmund Hillary, making him one of the first two people to summit Mount Everest in 1953. This is the first extraterrestrial landscape to be named for someone from Nepal. The plains, Sputnik Planum, are named for the original space explorer: Sputnik 1, the first artificial satellite above the Earth. These names fit the secondary exploration theme for place names on Pluto, and make a more pleasant change from the dark gods populating the dwarf planet so far. The animation was created from images taken by the Long Range Reconnaissance Imager (LORRI) on the New Horizons probe during the Pluto flyby on July 14, 2015. Using photographs taken from just 77,000 kilometers (48,000 miles) away from the surface, the resolution in the subsequent animation is good enough that features as small as a kilometers across (0.5 miles) are visible. So much geology and geomorphology is going on in this animation that we’re going to need to get back to you later with a full breakdown. For now, check out this how-to guide to learn how a geomorphologist looks at a new landscape like this. Update: Here’s the science of everything you’re seeing!